Book Review The new edition of the Drawing on the Right Side of the Brain Workbook. This course is now full please contact me to go on the waiting list. "Didn't want the course to end!! In 5 days I have learnt so much with regards to drawing, perception and not being afraid 'to go for it'! The course exceeded my expectation due the combination of great content, an amazing teacher and a lovely group of people who went on the drawing adventure together. A new 'definitive 2nd edition' of Betty Edwards' Drawing on the Right Side of the Brain has just been published, along with the DRSB Workbook. I thought it would be useful to have a look at both books and see what is different. This month I'll be looking at the Workbook. Viewfinder - This is the most useful tool and was developed by Dr Edwards and Brian Bomeisler. It's great for gaining an understanding of the concept of the picture plane and for scaling up and down. You can make your own or order it from DRSB Inc but to have one included here is a bonus. Just remember to stiffen it with cardboard. 40 drawing exercises across 5 sections. Each section covers one of the perceptual skills of drawing (Perception of Edges, Spaces, Relationships, Lights & Shadows and the Gestalt). If you work through the book methodically you should gain a good grasp of these skills. 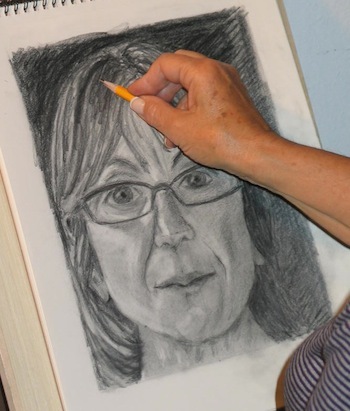 Each exercise is accompanied by teaching points, step by step images if appropriate, a suggested time and sometimes student drawings plus post-exercise comments. The Workbook includes blank pages with a printed 'format' for you to draw in. However, personally I'd recommend doing your drawings in a separate pad as it makes a huge difference working on proper drawing paper. However, if you'd like to keep all your drawings in one place sequentially, then it's a good option to draw in the book. It also includes some 'blank' formats so you can do additional drawings in the book. So to sum up - I still highly recommend the Workbook if you haven't already got it. However, if you have the previous edition then I don't think the new edition is going to give you anything significantly new.